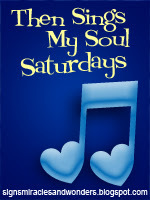 I love Saturday mornings because I get to participate in Then Sings My Soul Saturday. I join with Amy of Sign, Miracles and Wonders and other bloggers. We add a song and we get to visit one another and sing and worship. I keep coming back to the Brooklyn Tabernacle Choir for many of my songs. This one is "Nothing Is Impossible". It speaks to me as I've been going through a difficult season in my life. But I cling to the fact that nothing is impossible with my God. Nothing is too hard. When I consider who He is; the Creator and Sustainer of all things, how could I even question His ways and His timing? I pray that you will enjoy this song as much as I do. My friend I pray for a very happy and peaceful day for you today! Thank you for sharing God's truth in this wonderful song. I hope you make it through the storm soon... No matter how it rages, Jesus will never let go. He has your hand and will lead you through. First, you made me cry with your comment to me. My friend, you have no idea how I have run to the cross during this ordeal...and Jesus has just met me there each and everytime. So I must testify to others!! I won't let the rocks cry out.....I simply must! Next, this was a beautiful song. And I have so enjoyed you participating in TSMSS because you always come up with the most beautiful encouraging songs too! I love you, my friend. Happy Saturday! Such dynamic energy and uplifting joy! Oh yes! Lord! Is it irreverent to say that those types of video remind me of the Sister Act movies? That was great, Debbie. Yes, nothing is impossible with our God. Praying He will meet all your needs according to His glorious riches in Christ Jesus. Thank you for sharing this song! Praise Him... I will in all things-this ministered to me. May you find continued strength and joy in the Lord during whatever you are going through! Nothing- no nothing is impossible for our God! Wanted to stop by and say "hey" as we do down here in the south:-)...and remind you of my love and prayers today. Just played the video and it SO lifted my spirits! Thank you, friend. Nothing is impossible with Jesus - something I want to remember, especially now. Praying His grace for your struggles, His peace and rest for your heart, His power in your weakness - for His love is our comfort and joy. Love you! Love the soul of this song! And Lord, please send forth renewed hope during this difficult time. You know what's going on and you have a way out. Wanted to stop in and say hello. I've been out of the loop lately with visiting. This is an encouraging message and beautifully sung. Oh wow, what a GREAT song! I really enjoyed this tonight.